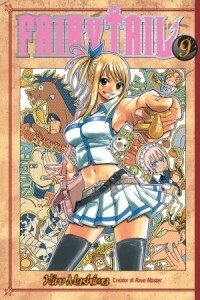 In the aftermath of the war against Phantom Lord, Fairy Tail is investigated by the government. They are found innocent, but remain under heavy scrutiny by the magic council. While the guild is being rebuilt, Lucy slips away to confront her father about his actions against her guild. With everything wrapped up the team is able to start going on jobs again, in a one off chapter they put on a play for a failing theater house, and in another Lucy finds herself embroiled in the mystery of Loke’s past. While volume eight was all about action with a little bit of comedy, volume nine has little action, and rather focuses on the aftermath of the previous arc and comedy. It’s important because it gives readers a chance to breath in between the larger arcs. I was a bit surprised, however, that we only really get one single chapter story before moving on to another multi-chapter story. Granted there’s no big bad to defeat in Loke’s story, but it’s still an important character moment for him, much like how the last two arcs had been important character moments for Lucy and Gray. The followup to any action packed story is the most crucial part of any manga. Most readers will stick around if the action is really good, but the chances of keeping readers is increased when the non-action chapters are well done. And in this case we not only get to see the beginning of Juvia stalking Gray, we also get what I consider the funniest bit of comedy in the entire series. In regards to Juvia, while stalkers are a serious matter, and I could see why some would use her behavior this volume against her, I can’t help but just be entertained. It’s cute and funny, and I really can’t ask for more out of a breather chapter. The Frederick and Yanderica story is by far the funniest thing to come out of Fairy Tail. Even after multiple rereads I find myself chuckling and even laughing out loud. Loke’s story, which takes up exactly half the volume, wasn’t my favorite story the first time I read it. I confess that at the time I was a bit of a shipper, and seeing Lucy spending so much time with a character that wasn’t who I shipped her with annoyed me. But, that would be a silly way to judge a story, so instead I’m glad that I have since locked my inner shipper deep away and can approach this from a rational standpoint. After this reread I must say that I enjoyed Loke’s story a lot more than I did initially. What strikes me most is how it gives Loke his own little arc, without there being some kind of demon from his past to defeat, something that Mashima has done quite literally in previous arcs. In Loke’s case his big bad is his own sense of guilt, and rather than defeating this demon through brute force that acts as a metaphor for friendship, in this case Loke is literally saved by the power of friendship. Though, I will always be wondering what exactly Karen had Aries do for those men. I most definitely know what I thought back when I first read this story-I was reading a lot more of the pulpy seinen variety of manga back then and my mind kept jumping to the worst assumptions-and it certainly contributed to why I didn’t like this story at first. Since then I’ve actually gotten a bead on what Mashima’s writing style is, and I think I can definitely say that he didn’t intend for us to assume the worst. Or at least I hope he didn’t. Otherwise I might start hating this story again. Nonetheless, I highly recommend this volume not only as a followup to the last volume, but for the comedy and a rather well written bit of back story for a character that had until this point been mostly incidental.